Twenty22-India on the move: Some GST relief! 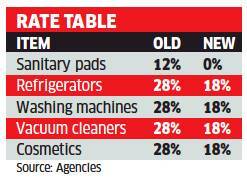 The common man had much reason to cheer, with the Goods and Services Tax Council approving reduction in the rate of a number of items, including refrigerators, washing machines, video games, coolers, leather goods, paints and varnishes from 28% to 18%. Businesses will see a significant reduction in compliance burden with the introduction of a simple monthly returns. Small businesses with turnover up to ₹5 crore can file quarterly returns. There will not be any tax on sanitary napkins, rakhis and fortified milk, while hotel rooms will be charged tax on actual tariff and not printed rate, which will simplify the regime and lower tax on hotel rooms that were so far charged tax on the published rates. Televisions up to 25 inches will be taxed at 18%, against 28% earlier, along with perfumes, cosmetics, shavers, water heaters, vacuum cleaners and kitchen appliances. Footwear up to ₹1,000 will now be taxed at 5%. Earlier, this limit was ₹500. Many handicraft items will now be taxed at 12%, down from 18% earlier. The reduction will be applicable from July 27. The sharp cut in tax means the 28% rate is largely now on sin goods and the luxury segment, with the exception of cement. Ethanol supplied to oil companies will be taxed at 5%. E-books will be taxed at 5%, against 18% earlier. The 28th meeting of the GST Council was chaired by Finance Minister Piyush Goyal. The council also approved changes to the laws to implement its decisions, including an earlier approved increase in composition limit to ₹1.5 crore from ₹1 crore.